Twenty-three currently active battalions of the Regular Army earned credit for campaigns during the War of 1812: two Air Defense Artillery battalions, six Field Artillery Battalions and seventeen Infantry battalions. These twenty-three battalions represent two Air Defense Artillery, four Field Artillery and seven Infantry regiments. 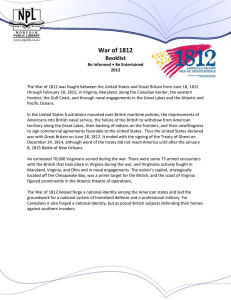 Three additional Air Defense Artillery regiments have been awarded shared credit for War of 1812 campaigns, but the lineages of the artillery companies that earned those credits have not been perpetuated by currently active battalions.There are also twenty-four Army National Guard units with campaign credit for the War of 1812.